Several years ago, Hallmark created their Polar Express bell - a very expensive collectible, that coincided with the release of 'The Polar Express'. 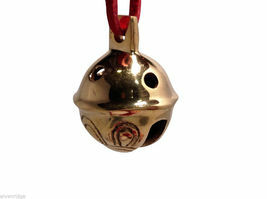 Many families wanted to give the gift of a bell, but the prices were prohibitive. I created this custom, hand-made, reasonably priced alternative Elfworks Lane, where I live and work. 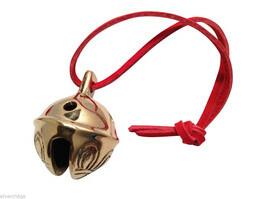 Accept no substitutes - I offer these bells again this year, at all different prices, to fit your budget. This is my lower end brass bell, a real sleigh bell, with leather strap, in a nice hand wrapped package, and a candy cane striped lid. The bell sits on a nest of 'reindeer snow'. 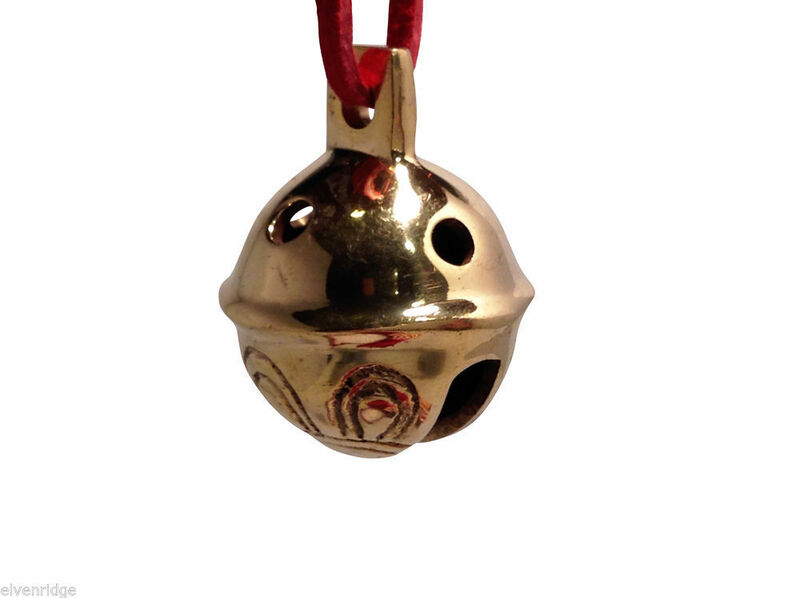 Kids love these bells, and they were a big hit all across the world. "As the head elf, I just want everyone to know that I have a special relationship with each and every bell and every package that leaves Elvenridge and goes into the world. Our gift recipients need to be delighted, or we will do everything in our power to make it so..."
There are no company logos or marks anywhere - so you and your loved one can be assured that these are authentically elf-made and not mass produced. These make a great gift for any Polar Express Train / movie lover, OR for anyone who you wish to deliver the "BELIEVE" message to! We have experience with large volumes also - these make thoughtful and fun handouts for company parties and special parties and events. This particular bell is an ACTUAL sleigh bell. It has good weight, being brass, and has a pleasant ring. Measures approx 1 1/2" diameter (including the tang - the sticky outie part that the leather is attached to!). Check our store for many more options in bells - nickel chrome plated (silver color), rare gold plated, antique, large and small. "Happy New Year! Just thought I would tell you that BY FAR the bell is my son's favorite gift that Santa brought to him. (He is 6 1/2) He has shown everyone he knows and explains why it's so special... it's from the sleigh.... look at the engraving... look how it's worn... look at the leather & the box! We are so happy and want to thank you for your help! He has a friend who has the Hallmark version and even she was in awe at the -real- bell. Thanks again & happy new year to you and yours. " "I know I left feedback but I wanted to share something with you. I ordered this bell for my 9 year old grandson because he asked Santa for a reindeer bell for Christmas, thanks to you it got here in time to Canada and it was the biggest hit for him. I read him the Polar Express on Christmas Eve and he said he asked Santa for a bell and wondered if it was silver or gold. Well Christmas morning he has so excited to get his SILVER bell. When asked even a week later what was the best Christmas present he got it is always 'the bell' over games, MP3 player, snowboard, everything! Thank you for making his Christmas so special, we can all believe!" "Thank you, bell arrived today and I am very pleased with it ... probably the best packaging I have seen. " "Received bell today. Absolutely perfect!! Thank you!!!" "My children loved the bells! They even made a believer out of me! Thanks!!!" "My son is still on air over this bell. Thank you for making such a special gift." "My little boy LOVED it! He carried it around for days! Thank you!!!" "My daughter loved receiving this. She even claims it smells of 'reindeer'." "Truly the spirit of Christmas...both kids favorite gift. A+++++++"
"WOW - incredible bell...... kids best present....."
"My daughter (age 6) truly believes this is a bell from Santa's sleigh. Thanks!" "This was the BEST Christmas gift I ever GAVE - Awesome Service - Quality is A+"
"Brass Sleigh Bell: $19.99....The Magic of Believing: PRICELESS. Thank You! "